This is a simple Text Animation program. 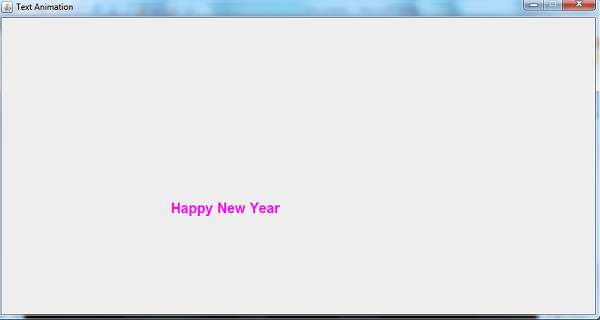 When the program starts the text "Happy New Year" moves from different locations on the frame window. To make the text move, we a need a label object to display this text. Then locations of the label object are changed by using a while loop. 2 Introduce classes in swing package to the program. The two packages are required in drawing the program interface. In this program, we need only one frame window and a label to show the text to be animated. 3 The Animation class contains Java code to draw the program interface and do animation. 4 Declare a JLabel lblText. 5 Animation is the constructor of the Animation class. When an object of Animation class is created, the code in this constructor is executed to draw program interface and do animation. 6 Set frame window title. 7 Set the layout of the frame window to null so that you can customize the location of the components on it. 8 Create the JLabel object LblText. This object contain the text "Happy New Year" to be animated. 9 Define size of the JLabel object lblText (width=200, height=50). 10 Define the size of frame window (width=850, height=450). 12 Allow the frame window to close when the user clicks the close button. 13 Add the JLabel lblText object to the frame window. 14 Make sure the frame window visible. 15 Invoke the doAnimation method to animate the lblText object. 16 The doAnimation method contains code to animate the JLabel object lblText. The animation on the object is performed by changing its location (x,y). A while is used to change the location of the object by increasing the values of x-axis and y-axis of the object by 20. When these values are nearly equal to the width and height of the frame window, they are reset to the initial values (x=1,y=5). The sleep method of the Thread class is invoked to delay the action of the lblText object (chaning from one location to another location). We delay the action by 200 milliseconds (sleep(200)). 17 The TextAnimation class has the main method to start the program. This article is about the pharmacology field and bunches of individuals working in this field. The general population who are as of now working in this field ought to see all the fundamental things and endeavor to enhance this field and assignment writing australia help me a lot to find out good info. This is the great wellspring of helping material.